PULP: Reclaimed Materials Art and Design is a Toronto based not-for-profit corporation set to encourage community building and environmental awareness. 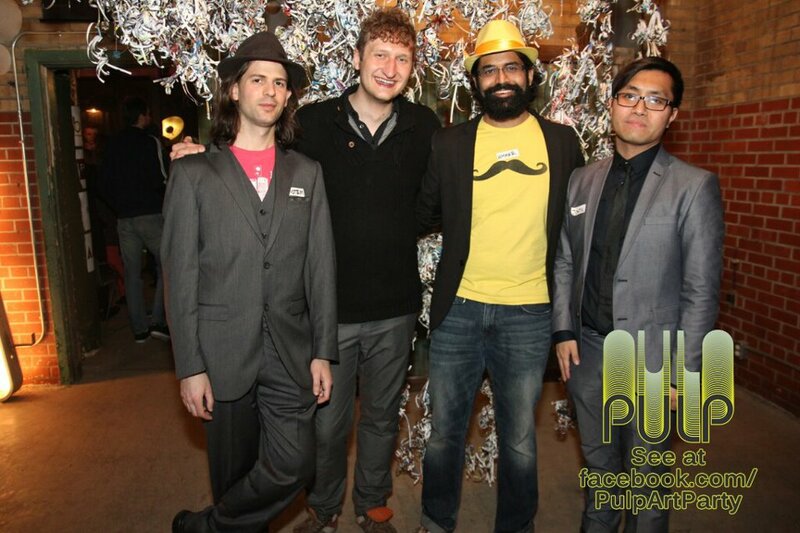 PULP is about promoting the use of public space in the city. We coordinate various outdoor and indoor activities with a growing network of groups, artists, organizations, and volunteers. We then invite the neighbours to join and be happy with us. Since our debut event in April 2013 we have made many friends and we find more every week. There are a lot of people in Toronto who are smart, motivated, and capable – we want to get to know you all. We believe that being environmentally aware is not a chore, but an opportunity for a good time. We want visitors to enjoy spaces designed from reclaimed materials and used to facilitate activities. If we want to have a party, we set it up from blue-bin paper; if we need protection from the sun and rain, we build pavilions out of reclaimed cardboard tubes. Along the way we gain valuable research on techniques to re-purpose materials otherwise discarded or recycled. We hope to form connections with other groups doing similar research and advance techniques and methods together in an open source fashion. Most of all, PULP is about bringing people together. We believe in a city inhabited by neighbours, families, and friends; not passers-by. It is our delight to get involved in community building events and we hope to contribute as much as we can to neighbourhoods which can benefit from our efforts. Neighbourhood associations and community groups are invited to contact us and start a conversation about possible events. We are always looking for volunteers, artists, community groups, businesses, and anyone else interested in helping us improve our city. Check out what we have in store next and join the fun!